Congrats! You’re having a baby (or you are having a shower for someone who is.) While it’s tempting to go overboard on the cute and cuddly in celebration of the life-changing event, it’s best to keep your head when planning for the baby shower. Here are essential suggestions for keeping the costs of your creative celebration under control. Avoid inviting everyone from your Facebook friends list to the baby shower, especially if you’re doing it simply to fulfill the gift registry. Many people are having a hard enough time getting by in this economy, and you don’t want to seem like you’re just seeking out their presence as a way to get more presents. The tactful and genuine thing to do is invite close friends, close family, and one or two “have-to’s” that you know want to be there (like an ex-sister-in-law that you know will come, anyway). If you’re planning everything for an expecting friend, be certain to get her approval on the list before sending out the invites. Most people assume that there will light food options at any shower, and they are not expecting to get full at the event. To be certain that you don’t disappoint, however, be sure to indicate that “light refreshments will be served” on your invites. This can signal to guests that they had better eat before they arrive, or make plans for a full meal upon returning home. 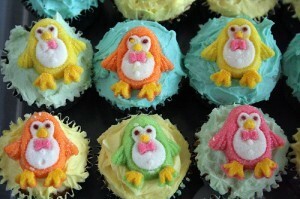 Baby showers can drag on forever, making it boring for guests and costly for those providing the snacks and activities. Instead of opting for a never-ending early afternoon event, try doing a late-afternoon party, starting at 3pm or so. Guests will have to get home for dinner after no more than two hours, and this will guarantee that no one will hang around longer than their welcome. If alcoholic beverages are the expectation for the shower, go ahead and design and serve just one signature drink with a fun baby-shower theme. By choosing a special mixed libation that’s particularly sweet or indulgent, you will likely serve no more than one drink per person and can keep costs down compared to that of a full bar. (Those that do tolerate more than one will be balanced by those who pass on the alcohol.) You won’t appear cheap, just festive! For food and desserts, it’s best to make small or “petite” servings. Not only are they cute and perfect for celebrating a tiny new person’s entrance into the world, they can actually encourage guests to eat slower and less often during the event. Mini quiches, smaller crackers, tiny cupcakes, and other miniature and affordable appetizers seem classy, and they are very affordable to make. Baby showers are by no means the most expensive event you’ll host in a lifetime, and it won’t compare to the cost of raising a child. By being prepared with a responsible plan for feeding and entertaining your guests, you can kick the cost of any surprise elements out of the party plans. If you need more ideas here are some ideas for baby shower supplies. What tips do you have for creating and planning the perfectly-priced baby shower? Thanks for the tips. As we are expecting our first in October this list will help Mrs. SPF plan! I like the brunch shower theme. Breakfast food usually isn’t too pricey. Also you can have it from say 11-1…people can go on with the rest of their day.